The media is not your enemy. They should not be feared, avoided or perceived as a threat to your business, but rather as an opportunity to speak on important issues or greater messages. Every article, news package or soundbite requires a professional comment or an interview from a credible source to get the story rolling. If you’re ever contacted by the media to speak on a topic, the way you present your thoughts and ideas will impact how you and your organization are portrayed. Essentially, you have the power to influence what will be written. As someone who has worked in the media, I have interviewed hundreds of individuals on a variety of topics. My interviewees have discussed controversial subjects, political opinions, monumental decisions and exciting announcements. But the one thing I will always remember from my time as a reporter was how my interviewees responded to questions. And you can probably guess that those who communicated poorly were the ones who stood out the most. Far too often people overshare, under-prepared or give dull interviews that fall flat. But here’s the thing: you can’t be misquoted if you structure your thoughts and present them in a compelling way. So, how do you give a flawless media interview? It goes without saying that reporters will never use your entire interview for their story. Depending on the nature of the topic, an ideal media interview shouldn’t run longer than 10-15 minutes. Broadcasters typically use a 10 second soundbite and print journalists will only take a couple of sentences they find most compelling. It’s nothing personal. Journalists are just doing their jobs and those jobs come with a 500-word limit. This means you have only seconds to articulate your message. During your interview, don’t meander off into a tangent or blurt out something just because the thought comes to your head. When an interview stretches too long, the message will get lost. Prepare for your interview by writing down three or four key points that you want to get across. Then, reinforce your message as often as possible. Be prepared for follow up questions that challenge your statement. Journalists look at every angle of a story, so be ready to defend your position or address concerns. Carefully plan what you’ll say in advance and practice variants of your speech over and over again to ensure it is delivered appropriately. The name of this game is clarity. Your message can’t be misinterpreted if it’s clear and concise. No one likes an overly-prepared media statement. While it is an excellent first step to prepare for an interview, overdoing it can have negative consequences. Your comments should be professional and intellectual but also conversational, natural and honest. You don’t want to sound like a prerecorded press release. By repeating a statement word-for-word, the interview is at risk of appearing cold, unauthentic and boring. 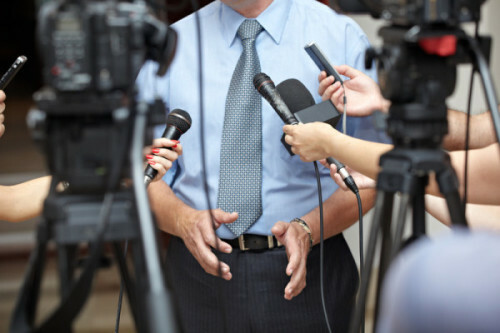 Media exposure is an excellent way to speak on important issues or decisions from your organization. You were not called upon by the media to pitch an ad campaign; you were sought after because you are an expert on a particular topic. Research tells us that an audience will respond better when the speaker is candid. There is a certain human element that an audience craves and it will not be achieved by reciting a memorized script. Structure your thoughts into subheadings rather than full sentences. This will be easier to retain and as a result, you can openly discuss an idea with your own voice, cadence and vocabulary – not one that was pre-written. Did you know that most journalists write their stories for a grade 8-10 reading level? This is to ensure that the majority of readers will be able to understand the main message. Not every person watching or reading your interview will have a large vocabulary or even a basic knowledge of what you do. There are often terms and concepts that are exclusive to your industry alone. Keep your language simple and to the point. Avoid flowery sentences or phrases and if you can find a basic substitution for a word, use it. Don’t say “equilibrium” when you can just say “balance.” The simpler, the better. When a person uses difficult words or presents ideas in a complicated way, they are at risk of confusing their audience and creating frustration. You want your message to be understood, not send your audience to the dictionary. Is your topic of discussion very complex? Break down difficult concepts and take time to explain what certain items mean. A great way to do this is to create metaphors and analogies that are similar to something your listener already understands. This quickly allows your audience to comprehend your ideas, even though they might have limited background knowledge in your expertise. It’s time to break down the long withstanding wall between the press and the public. Media outlets have the power to bright light to a situation, tell the truth, or spark interest on a particle topic. But you have the power to determine what will be written. The words you say in your interview will be interpreted in your favour if you are able to summarize your points succinctly and with impact. How you think greatly influences how you communicate. Slow down, collect your thoughts and structure your arguments. Do not wane under the camera lights or media scrum, but instead take the opportunity to stand out, speak up and be remembered for your message; not the quality of your interview. Ashley Denuzzo is the former Content Marketing Specialist at McLuhan & Davies. She comes from a wide background of media, journalism and marketing. Ashley has worked in both print media, television and is a trained voice actress. Ashley lives in Toronto, Canada and continues to contribute for the MDC blog. Fine-tuning your delivery style for more dynamic & persuasive presentations. Adjust your communication style to connect with and engage any audience. The Internationally Acclaimed Workshop That Trains You to Organize Your Ideas FAST! MDC's services include training in presentation skills and business writing. MDC's unique product Think on Your Feet® has gained a global reputation as the product-of-choice to train professionals in analyzing, organizing and presenting their thoughts quickly, clearly and with impact. Warren Buffett Knows Best: Want to be successful? Learn to speak and write clearly. Avoid the Grand Vision – Seek the Opportunity! What to do when your audience isn’t engaged.